Waste to Energy (WTE) Market size was over USD 20 billion in 2015, with estimated gains at over 6.5% CAGR up to 2024. Rise in power consumption owing to rapid industrialization accompanied by increasing focus to derive energy through renewable sources should drive waste to energy (WTE) market size growth. China, India, Brazil, and Mexico backed by founding Public Private Partnerships (PPP) to fund the projects and follow strict timelines may improve waste management systems and adopt alternative renewable source to generate energy from waste. Recycling industry growth across U.S., Netherlands, Japan and Germany should positively influence waste to energy market size growth. As per a World Bank report, lower middle-income group are responsible for more than 1,012,320 tons MSW generation per day in 2015, which may exceed 2,618,800 tons per day by 2025. High Income group generated 1,649,546 tons of solid waste per day, which is estimated to reach 1,879,590 tons per day by 2025. Regulatory compliance on waste deposable and treatment techniques in order to reduce GHG emissions are key trending factors driving waste to energy market share. In 2015, over 1,620 landfills and 85 dumpsites were identified around the world U.S., China, India, Indonesia, and Brazil were the major contributors. China may to generate about 300,000,000 tons annually, trailed by the U.S., accounting for 228,614,980 tons per year. Growing industrial and domestic wastes has prompted government of North America and Europe to generate energy from waste. Moreover, shift in trend towards replacing conventional energy generating from fossil fuels with renewable energy to ensure energy security and reduce carbon emissions are potential factors to drive industry growth. Favorable regulatory norms accompanied by government schemes such as tax incentives should support waste to energy. EU has implemented few policies including high landfill taxes & fees, renewable portfolio standards, carbon tax, and direct subsidies to reduce fossil fuels dependency. Ample amount of waste and restricted landfilling are other major issue driving industry growth. Adequate amount of waste to be used as feedstock is largely attributed towards economic growth which is correlated to the consumption and rapid industrialization. High cost associated with plant infrastructure and installation of expensive components may threat industry growth. Furthermore, additional capital involved in flue gases treatment and other produced residues along with operational cost may impact waste to energy market price trend. Thermal waste to energy market size was worth over USD 16 billion in 2015. Thermal based incineration process was the dominant technology implemented for waste to recovery system. Ageing equipment contributing to GHG emissions may get replaced with modernized equipment. 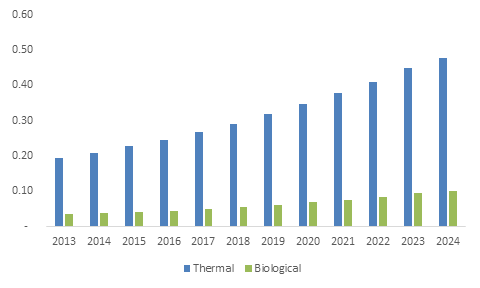 Alternative thermal technologies such as pyrolysis, gasification and plasma arc gasification are expected to lower carbon emissions and witness an increase in demand. Biological technology market may expect highest gains, growing at over 11% CAGR up to 2024. Anaerobic digestion prospects are consistently improving, and a continuous capacity expansion is predicted. Anaerobic digestion is predicted to replace composting step for the biodegradable waste treatment generated from MSW. Increased waste production along with regulatory compliance to minimize environmental impact are key factors driving Europe waste to energy market growth. The region has come up with various directives including Waste Framework and Landfill which may help in setting waste recycling targets through incineration techniques and landfills. The regional thermal technology was valued at over USD 7 billion in 2015. Germany, UK, and France are major contributing countries due to the presence of efficient solid waste management systems. U.S. waste to energy market size, driven by effective waste disposable methods expects growth over 6%. At the end of 2015, U.S. had 71 WTE plants which generated electricity in around 20 states. According to EPA, U.S. generated about 254 million tons of MSW in 2015. EIA has estimated that WTE plants processed about 29 million tons of MSW in 2015 of which 26 million tons was used for power generation, while the remaining MSW was either recycled, landfilled, disposed or composted. Countries such as Japan and China have invested in sustainable growth models such as Sound Material Society Model and Circular Economy model which regulates the environment pollution and forms an integrated management resource which may fuel APAC waste to energy market growth. Global waste to energy market share is competitive in nature with Wheelabrator, Covanta, Tenologies, Hitachi Zosen, and Keppel Seghers being the major industry players. Some companies are integrated MSW management companies and have presence across the value chain. Other major industry participants are Foster Wheeler, Mitsubishi Heavy Industries, China Everbright International, Xcel Energy, Green Conversion Systems, Plasco Energy and Veolia Environment. In Europe, WTE market projects are funded by the EU and national government funds as the technology providers and waste management companies specifically agree on legally binding targets and timelines. Also, private companies and International Financial Institutions also fund the waste management industry with respect to policy focus on waste management. The policy development pertaining to solid waste management is based in Europe and Asia Pacific, meanwhile in the U.S., local regulatory bodies are responsible for solid waste management with central government having a small role in legislation development. In Asia, the solid waste management funding is done by majorly through government funds. Also, in order to fund shortages, funds are also sourced from Public Private Participation (PPP), International bi-lateral and multi-lateral financing. A number of the multi-lateral funded projects are for provision of technology and know-how of disposal and recycling projects and restrict the participation of players in the contract to large multi-national players. As such, local companies do joint ventures with such firms to participate in the projects. Integrated waste management companies provide services ranging from waste collection to processing or disposal. These companies are more prevalent in regions of North America and Europe where local municipalities are likely to contract with waste management streams. Specialized waste management companies present across the value chain transfer the technology to the plant operators and charges technology license fees. Most of these companies are privately owned. Technology vendors present across the value chain offer services or products such as IT solution, control technologies, solid waste processing hardware and RFID technologies.